A locals' favorite for over 15 years, Moonrise Jewelry is a one-of-a-kind jewelry store specializing in unique, coastal-inspired accessories, designed and handcrafted in Cape Charles. Designer Meredith Lusk and her team of local artisans have received national recognition for their eco-friendly line of Genuine Fish Leather jewelry, a colorful exotic leather from Iceland. Moonrise Jewelry's ever-evolving collections feature unusual freshwater pearls, semi-precious gems, and Swarovski crystals in a broad range of styles that appeal to women and men of all ages. 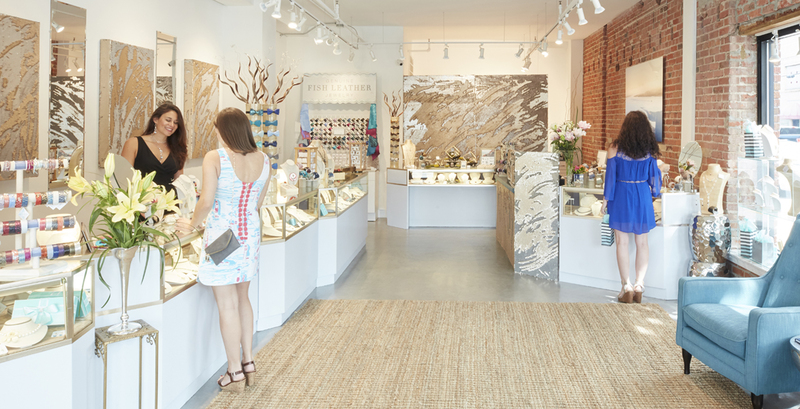 Recently named "One of the South's Best Boutiques" by Southern Living magazine, Moonrise Jewelry is a not-to-be-missed destination for shoppers, located in the beautifully-restored Wilson's Department store building in the heart of Historic Cape Charles. Our store is open year-round, and we look forward to your visit!